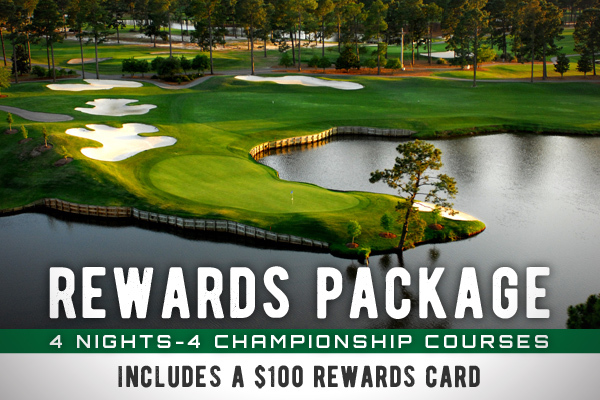 A $100 gift card is all yours when you book this 4-round golf deal - The Prime Times Rewards Package. Design your package from over 20 championship courses, and after you're done, use your $100 gift card for beer, food and merchandise at participating courses! The BEST Golf Package you'll find anywhere! Design your package from a choice of over 20 championship golf courses. Each golfer in your group will receive a $100 gift card, breakfast each morning and 1 dinner certificate to Divine Dining Group when you book this 4-round golf deal. DISCLAIMER: Package price per golfer based on quad occupancy in a 2 bedroom golf villa. Advertised from rates based on playing Aberdeen CC, Burning Ridge, Colonial Charters & MBN West. Rates vary based on course selection & stay dates. Dinner certificate to Carrabba's Italian Grill is for up to $15 credit on single entrée item. Valid at the Myrtle Beach, North Myrtle Beach, Murrell's Inlet Carrabba's Italian Grill locations only. $100 gift card is to be used for food, beverages, apparel and merchandise at any of the 20+ golf clubhouses (Course list subject to change). Gift cards hold no cash value. Not valid with any other offer. Rates subject to change based on course availability. Offer subject to change without notice. Plus tax and fees.